Chair mat for carpet standard thickness 1/8" low pile for carpet. These carpet chairmats are affordable and work very well on commercial carpet and carpet without padding. Standard sizes range from a 36x48 up to a 60x96 and custom sixes are available. Standard affordable chairmat for commercial carpet and carpet no padding or carpet with rubber backing. 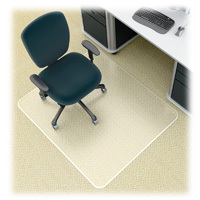 Protect your carpet and allow your office chair to roll with ease and support your office chair. Lifetime Warranty on all standard thickness chairmats. Fast free shipping.